The sixth annual Electric Electric Aircraft Symposium, CAFE’s premier event, got a lot of press attention this year, including lead story status from AOPA and acknowledgement from Engadget and AVweb. We’ll start with the one that’s most fun to listen to – a podcast from AVweb. 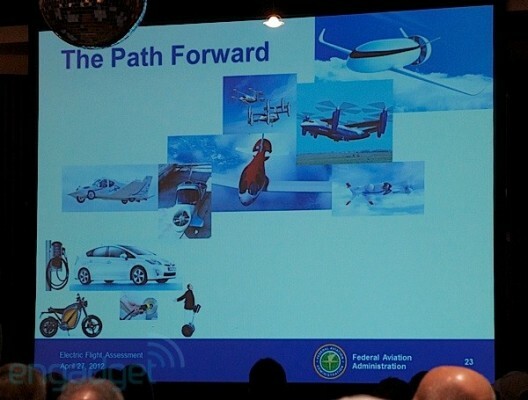 Mary Grady of AVweb interviewed Dr. Brien Seeley, President of the CAFE Foundation, about the just completed Electric Aircraft Symposium at Santa Rosa, California, which drew participants from at least eight countries and 10 multi-national corporations. With Federal Aviation Administration representation and a former Environmental Protection Agency head signed up to attend, the Symposium drew some high-level attention this year. Dr. Seeley was enthusiastic about the rapidly maturing technology and industry, with Tom Gunnarson from the FAA and Ronald Gremban of ForSites Corporation working toward standards and practices for electric aircraft. When asked about the thought that FAA rules for small electric aircraft might be five to 10 years out, Dr. Seeley noted the cell phone industry, which grew into place often much faster than users could expect. He said he was meeting with local Congress members shortly to discuss ongoing developments, including future Green Flight Challenges. Listen to the podcast for more thoughts on where CAFE and the new industry will go next. He was enthusiastic about Paul Schlein’s detailed plans for a small electric airplane that would make an all-out assault in electric speed records with a “credible” craft that could top 700 kilometers per hour (434 mph). He also liked the benchmark performance software being developed byAlfred Scott and described by Boeing engineer Norm Howell. Tine Tomazic and Jack Langelaan’s presentations that gave an insider’s view of creating and flying the GFC-winning Pipistrel G4 captured Dr. Seeley’s admiration, and he expressed great hopes for flexible solar cells described by Carlo Treves from HighFlex Solar. Aircraft Owners and Pilots Association (AOPA) online also gave feature coverage to the event, and Engadget discussed proposed FAA rule-making.